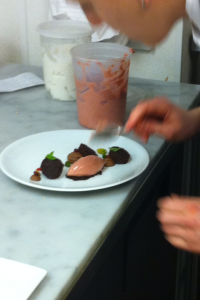 I whipped up this dessert tonight on the fly when I found out, a half hour into service, that one of pastry cooks was coming in to dine with her Beau. 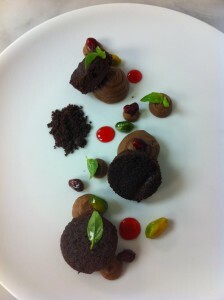 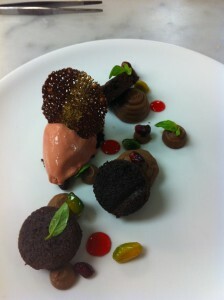 Basil and lime chocolate pate, pomegranate gelato, seeds and coulis, flourless chocolate cake with lime syrup. One of our back servers helped me take picture tonight so I’ll show the building of the plate.